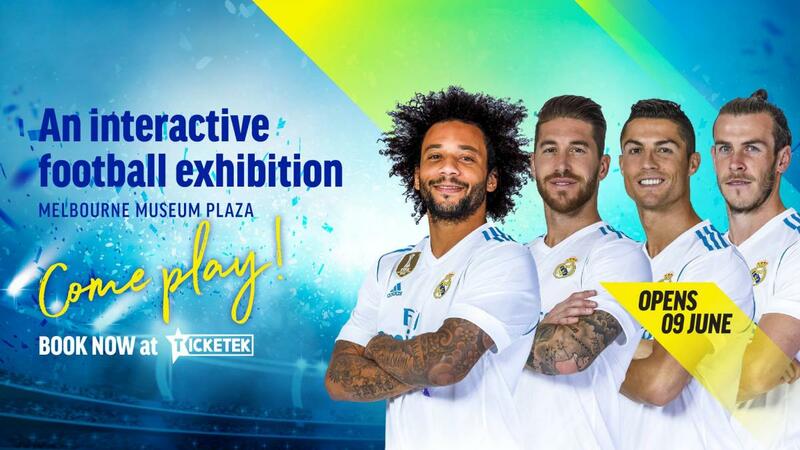 Real Madrid World of Football Experience will make its exciting world premiere in Melbourne this June, bringing football fever to the city ahead of the 2018 FIFA World Cup. Melbourne will be the first city in the world to experience the new, state-of-the-art, touring football experience and exhibition. Real Madrid C.F., honoured by FIFA as the Best Club of the 20th Century, has won a record 12 European Club Championships and 33 Spanish Club Championships. The Real Madrid World of Football Experience allows visitors to explore behind the scenes, feel the atmosphere and discover the culture as they go on a journey into over 116 years of sporting history. Designed to engage football and sporting fans of all ages the experience will be housed under the roof of a massive 50m x 30m (1,600 sqm) touring pavilion, located on the Melbourne Museum Plaza. It will feature unique physical and digital interactive experiences, an immersive 360˚ cinematic match day experience, an EA Sports FIFA Arena and a stunning collection of their most famous trophies and memorabilia. The club’s 12 UEFA Champions trophies, the FIFA Club of the Century trophy, and the most treasured Ballon d’Or and Golden Boot trophies will all be on display together for the first time ever outside Madrid. Coming to Melbourne for a limited season commencing 9 June 2018 in the World of Football Touring Pavilion, located at Melbourne Museum Plaza.